We first heard about the JamBase live festival a couple months ago, but the lineup finally was announced today. 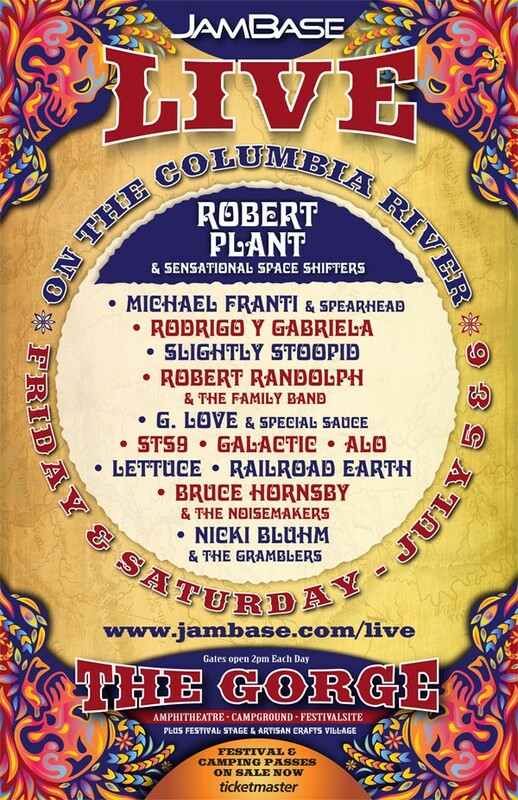 Taking place July 5 and 6 at the Gorge Amphitheatre, JamBase Live — produced by JamBase.com, a long-running live music directory — features mostly jam-oriented bands (but hardly exclusively jammers) that should make for a laid-back post-holiday weekend at the Northwest's music venue of record. This is hardly something on the scale of the immediately sold out Sasquatch! festival, but nevertheless a solid mid-summer treat for those who want to take in a festival at the Gorge. The headliner, Robert Plant, is nothing to scoff at, nor are the rest of the acts, including Rodrigo y Gabriela, Michael Franti and Spearhead, G. Love and Special Sauce, Slightly Stoopid, Robert Randolph and the Family band and a whole lot more. There's also a yet-to-be-announced slate of regional artists set to play on a side stage. Take a look at the poster for a complete lineup. Perhaps the most appealing aspect of this fest is the $75 ticket price for both days. That's almost unheard of for that many bands, especially at the Gorge. Tickets go on sale this weekend — and you can even get a $15 discount if you purchase on Saturday or Sunday.